The aesthetics of current rooftop solar can be a deterrent for commercial businesses looking to invest in renewable energies but with these new technologies, aesthetics or ample roof space may no longer have to be in question. When a solar panel resembles glass, it will be much more appealing to developers as it won’t detract from the design of building surfaces. With an estimated 5 to 7 million square meters of glass surface in the US, this technology has a lot of potential. It can be added to anything with clear surfaces such as windows on building or cars, cell phone screens or display screens. Basically anything that has a clear screen that sees a decent about of sunlight. Research at MSU was done to estimate that the that transparent solar panels on these clear surfaces have the potential to supply up to 40% of US electricity demand (science daily). In March of this year, the U.S Energy Information Administration released that solar now comprises 2% of total electricity generated within the United States. This percentage has been steadily growing throughout the past decade; in 2016 it was at about 1%. These numbers are vastly different from the 40% that is predicted with transparent solar technologies and in combination with rooftop solar, this renewable energy has a lot of potential in the United States. The way this technology works is quite fascinating because there are different ways to gather energy from the transparent surfaces. One method coats glass in certain materials that redirect light from the from the transparent surface to the edges where the solar energy can be collected. This is to ensure the surface is completely transparent because it was found that achieving complete complete transparency through standard silicon-based solar cells means there could be a reduced area for energy harvesting. Opaque solar surface technologies, another method, have proven to be successful in efficient energy gathering because but people are less likely to put them on building surfaces or windows due to their tint. Completely transparent solar cell technology does exist, but scaling it can be a challenge because of the properties of the materials. There is also a question of affordability due to the expensive nature of the materials and process needed to produce the technology. MSU posted a video online to exemplify what a transparent solar panel would look like and how it would work. While this is a breakthrough in the solar world, this technology still have a long way to go. Mr Lunt explained that transparent solar technologies only function at a third of their realistic potential, which means they are working now to make these panels not only environmentally viable, but also economically. The price of commercial rooftop solar has been declining over the years due to developing technologies and incentive programs. 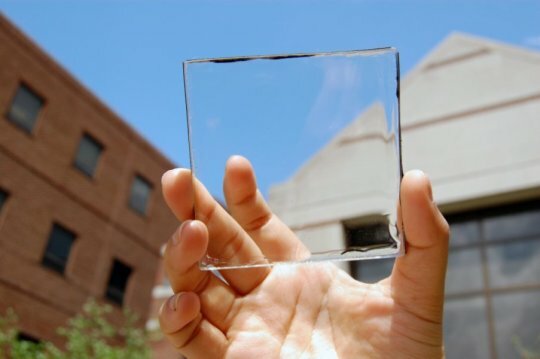 Transparent solar technology is less than 5 years old which means it has a lot of time to grow. It will be exciting to see where this this technology goes and how it will shape the worldwide renewable energy industry in the future.